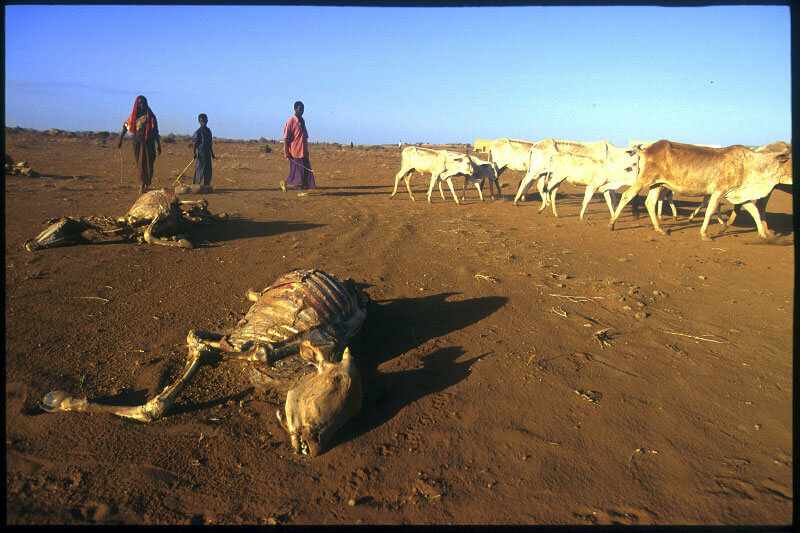 The Big Wobble: Two million animals have now been lost to the "devastating" drought in Ethiopia with nearly 10 million people starving. Two million animals have now been lost to the "devastating" drought in Ethiopia with nearly 10 million people starving. The Food and Agriculture Organisation (FAO) has said that two million animals have been lost to a "devastating" drought in Ethiopia. The UN agriculture agency said that the drought had devastated herders' livelihoods as it exhausted pastures and water sources. "For livestock-dependent families, the animals can literally mean the difference between life and death - especially for children, pregnant and nursing mothers, for whom milk is a crucial source of nutrition. "With up to two million animals lost so far, FAO is focusing on providing emergency livestock support to the most vulnerable pastoralist communities through animal vaccination and treatment, supplementary feed and water, rehabilitating water points, and supporting fodder and feed production". "The drought has led to a significant number of animals dying or falling ill, particularly in the southern and south-eastern regions of the country, as other areas recover from previous seasons' El Niño-induced drought," the UN agency warned. Abdoul Bah, FAO deputy representative in Ethiopia, said "some 8.5 million people - one in 12 people - are now suffering from hunger; of these, 3.3 million people live in Somali Region. "It is crucial to provide this support between now and October - when rains are due - to begin the recovery process and prevent further losses of animals. If we don't act now, hunger and malnutrition will only get worse among pastoral communities." According to Bah, by providing supplementary feed and water for livestock, while simultaneously supporting fodder production, FAO seeks to protect core breeding animals and enable drought-hit families to rebuild their livelihoods. In addition to FAO-supported destocking and cash-for-work programmes to provide cash for families, he said animal health campaigns would be reinforced to protect animals, particularly before the rain sets in - when they are at their weakest and more susceptible to parasites or infectious diseases. Bah said FAO urgently required $20 million between August and December to come to the aid of Ethiopia's farmers and herders. "FAO has already assisted almost 500,000 drought-hit people in 2017 through a mix of livestock feed provision, de-stocking and animal health interventions," he said. The support was courtesy of the Ethiopia humanitarian fund, Switzerland, Spain and Sweden through FAO's special fund for emergency and rehabilitation activities, the UN central emergency response fund, as well as FAO's own early warning early action (EWEA) fund and technical cooperation programme.